Google has announced plans to buy Nest Labs, a manufacturer of thermostats and smoke detectors founded in 2010 by former Apple engineers, Tony Fadell and Matt Rogers, for 3.2 billion dollars. 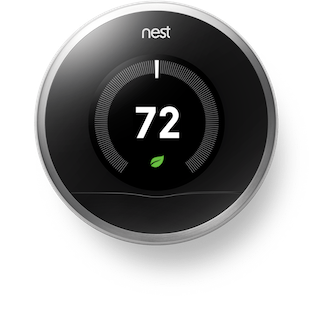 Nest Labs sells a thermostat called Nest which is very popular current in the United States thanks to its built-in intelligence and its design. Nest will continue to be run by chief executive Tony Fadell. The Federal Trade Commission and the Justice Department must still approve the deal, but this is only as a formality. With a price of 250 U.S. dollars, Nest is not a particularly cheap thermal regulator. Its intelligent functions have nevertheless convinced numerous buyers; Nest is able to learn within a few days to understand the lifestyle of its owner based on the temperature, humidity, activity and light sensors. It automatically shuts the temperature-control down when the residents are at work, and heats the apartment back up, before they come back. Nest can also controls the air conditioning in the house. It has many minor additional functions to help the owner to save money such as a small green leaf on the display of the Nest which indicates approximately when energy is saved and when the user sets a higher temperature it indicates how long the heating process will take. Such products are now paying off. There are many signs that a massive wave of digitalization will reach the apartments and houses of the industrialized countries in the coming years. Investors are pumping billions into the market and with Google, additionally one of the most important Internet companies now officially joins. For quite some time Google has already been interested in the topic home automation. Already in 2009 Google provided, along with PowerMeter, a free energy monitoring tool to raise awareness about the importance of giving people access to their energy information. The project retired the service September 2011. Later, in 2013, Google's project Energy Sense, a thermostat App, appeared in the Google-Play Store for Android phones. This type of heating remote control is also a feature of Nest. In 2011, Google also revealed for the first time the idea for Android @ Home; under the project Android smartphones should go ahead with home automation. The search engine company is becoming an increasingly broader imputed enterprise that shapes the future of smartphones, tablets, computers, eyeglasses, cars, robots, and possibly soon also our households. Whatever Google makes from its acquisition, it is clear that it will raise the interests of critics due to the fact that the many intelligent, clever facilities which the company and its products enable are mainly used to gather more information about its customers. For the company little has changed and little will change; Google is first and foremost an information collecting company. What changes is only the method by which Google retrieves to the data.